Technological advances shorten MR testing times. With CT and other studies that involve ionizing radiation, the Holy Grail is to reduce dose while still producing quality images. With MRI, it's shorter scans that are tolerant of patient motion. The good news is MR researchers and manufacturers have been moving swiftly in that direction and with much success. Thanks to advances in technology and computing power, researchers and clinicians have found ways to speed scan times, including by making patients more comfortable and sampling less. In some cases, they have been able to reduce scans that previously took up to an hour to less than 10 minutes. The less time an adult or child has to spend in the MR scanner, the better. "What's been revealed is that patients can only tolerate so much," says Chip Truwit, MD, FACR, chief of radiology for Hennepin Healthcare in Minneapolis and chief innovation officer for Upstream Health Innovations, Hennepin's innovation hub. When MRI first became widely available in the 1980s, a patient undergoing a study would have to lie inside the scanner bore for at least 45 minutes and often longer than an hour. It was hard for patients to lie still for that long. When patients move, it can cause image artifacts and make a repeat exam necessary, Truwit says. The shorter the scan time, the more comfortable the patients. 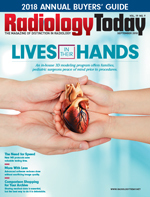 And the more comfortable patients are, the less likely they will move, says Lawrence Tanenbaum, MD, FACR, vice president, medical director east region, and director of CT, MR, and advanced imaging for RadNet Inc. According to a study published in the Journal of the American College of Radiology in 2015, one in five MR exams has to be repeated because of patient movement. The study also found that rescans due to motion artifacts cost institutions an average of $592 per hour—as much as $115,000 per scanner, per year. The motivation to reduce MRI scan times for children is even greater, says Shreyas Vasanawala, MD, PhD, who specializes in MRI at Stanford University. Children often have to be sedated if they are to lie still inside the tube. "If you can shorten scan time, you may be able to avoid anesthesia altogether, and, even if you can't, it's a shorter time they have to be under anesthesia, so it's better for them," Vasanawala says. Faster MR exams also have financial benefits, which are especially important in today's "economically challenging times," Tanenbaum says. With its Philips Ingenia Elition MR Scanner, RadNet has been able to reduce its scheduling time for MRs to about 30 minutes per patient, down from 45 to 60 minutes. Tanenbaum sees further reductions as the technology and techniques continue to advance. "Compressed sensing has reduced our already-concise routine imaging scan times from 30% to 50% across the board," Tanenbaum says. "This may allow scan slots of 20 minutes and an even more comfortable experience for patients." Shorter scan slots bring the opportunity to scan one-third more patients each day, he says. Researchers and manufacturers have developed a number of different ways to achieve faster scans without sacrificing image quality. Some involve getting the patient to relax more. Others include improvements in the planning, scanning, and processing of exams, and some involve machine learning and neural networks to reduce the number of sequences required to create quality images of the organ or region of interest. One way to help patients relax is to use music and videos that distract them from the overall unpleasant exam experience. This is not a new idea. "Music systems that allow the patient to listen to their choice of music have been around for a while," Tanenbaum says, but the early systems were cumbersome and "mostly collected dust in the corner" because technologists were too busy dealing with other aspects of the scan, and they neglected to offer them to patients. Improving the ambient technology and making it more user friendly has greatly increased its use, he says. For example, before being scanned in Philips' new Ingenia Elition 3 T MR system, patients can put on a video headset and choose an environment that they want to see from a touchscreen on the wall—a tropical island, a forest with pandas, or an undersea fish scene. With this immersive video experience, it is easy for patients to forget that they are inside the scanner tube, Truwit says. The system is linked in real time with the scanning software so it can provide information and guidance to the patient about the progress of their scan. Patients receive breath hold cues through their headphones and can see a personalized progress bar indicating how long they have been holding their breath and how long they have to go. The Herlev Gentofte University Hospital in Denmark found that 84% of the patients they surveyed indicated that the progress bar helped them to feel calm and made it significantly easier for them to hold their breath. When patients comply with breath-hold instructions, it reduces the likelihood of needing to repeat the exam, Tanenbaum says. Advances in surface coil technology have also resulted in faster scan times. In general, the more channels a surface coil has, the more signal can be harvested, and the higher the resolution that can be delivered. "Over the last year or so, we're seeing more higher-channel coils coming," Tanenbaum says. Most scanners use eight coils. Some have flexible coil options in 16 channels. "Now we are starting to see 16- to 18-channel rigid coils become available. This advance gives us a substantial boost, particularly if you're coming from older technology with eight or fewer channels," Tanenbaum says. New planning software that guides the technologist through prescribing image acquisition on the scanner is having an impact on scan time as well, Tanenbaum says. "Technologists universally cite implant requirements and safety procedures as impacting their ability to stay on schedule," Tanenbaum says. "The best software allows the technologist to prescribe the scanner within limits of the device and translate that through for all the individual sequences of the examination." Previously, technologists had to program each individual sequence manually and often indirectly, which was more time consuming and potentially error fraught. Simple one-time translation of operating limits allows technologists to proceed efficiently and without hesitation and can have an enormous impact on the day's workflow—not just for the patient on the table but all those who follow, Tanenbaum says. As the number of patients with implants increases with the aging population, it's more critical than ever for technologists to have the tools to proceed safely and efficiently. Planning software helps ensure they do. In addition, new computing capabilities have resulted in shorter scan times. Researchers have discovered that they are able to acquire undersampled data, saving significant scan time, and then use new, fast storage devices for memory extension to reconstruct clear and precise images. Guido Buonincontri, PhD, of the University of Pisa in Italy, is collaborating with GE Healthcare and Intel on a number of projects that could result in faster examinations for many conditions. For the past two years, Buonincontri says, "we have been working on developing fast imaging techniques, building a combination of different approaches for model-based reconstructions to obtain images from sparse data. We are able to get reliable base images from which we synthesize standard MRI contrasts." The group at the Fondazione Stella Maris lab in Pisa has focused on full 3D brain acquisitions with the capability of self-navigated motion correction, in combination with low-rank models. "In such techniques, we only modify acquisition and reconstruction," Buonincontri says. "No modification is made to the scanner hardware." However, the researchers require intensive computations to fit their models, he says. Thanks to graphics processing units, cloud computing, and, most importantly, new fast storage devices such as Intel's Optane Technology, "We have been less and less concerned with the computational efficiency of our approaches and more with making acquisitions more effective and useful for diagnosis," Buonincontri says, adding that new computing capabilities have become a major driver of innovation. "This is not limited to our lab," he notes. "Many approaches similar to ours are being investigated by several research groups worldwide as well as by major system vendors." Buonincontri's tools are ready for evaluation. A clinical study with 600 patients, 350 of whom are children, has just begun. Funded by the Italian Ministry of Health and cofunded by the Regional Public Health Service, the researchers will be collecting data over the next three years for a number of neurological and neurodevelopmental disorders. "We will be comparing the results of our fast scans [which are completed] in under five minutes [and] obtained without sedation, with a full, gold-standard examination during sedation of about 40 minutes," he says. The researchers will look at diagnostic accuracy directly. "We expect to identify a range of indications where sedation can be completely eliminated and the full diagnostic capabilities of MRI exploited using a fast, motion-insensitive, multiparametric scan alone," Buonincontri says. Possible indications include neurodevelopmental disorders, where children are usually referred to MRI to exclude brain lesions rather than to confirm the clinical suspect of structural brain abnormalities. "In other indications, such as the weak clinical suspicion of organic brain pathology, we expect to find that our methods are useful as a stratifying procedure," he says. "There, the sedation might be needed as a second-step procedure only in a percentage of difficult cases, if our fast assessments are not able to provide enough information to make a diagnosis." Another development that is helping to reduce MR scan times is the ability to postprocess scans with accelerated protocols. Medic Vision Imaging Solutions has software for this task, Intelligent Quick MR (iQMR). iQMR, which works with all vendor and model scanners, is a machine learning-aided iterative image reconstruction technology that allows users to reduce scan times by about 30% while maintaining the integrity of the images. iQMR software is based on the company's patented volumetric image processing algorithms that improve signal-to-noise ratios and enhance the images, says Medic Vision's CEO Eyal Aharon. iQMR software deconstructs the entire scan into 3D blocks or patches and extracts their feature sets using similarities between the patches and a proprietary statistical model. The model is able to differentiate between noise and signal and improves the routine image quality, Aharon says. The FDA cleared iQMR for use in the United States in May. Tanenbaum participated in research that found iQMR used on 1.5 T scanners reduced brain scan times by about 30% compared with routine protocols. Six neuroradiologists from four institutions were asked to compare the faster scan quality with those of routine longer studies. "Our study concluded that iQMR processing can produce clinically acceptable, routine-quality MR images at significantly shorter scan times," Tanenbaum says. Anthony Christodoulou, PhD, a research scientist at the Biomedical Imaging Research Institute, Cedars-Sinai Medical Center in Los Angeles, says his research team has had success speeding up MR exams with multitasking. "A lot of the early work in the last century was to get the machine to go faster," he says. "Now everything is about, 'How do we image smarter?' We've reached the limit on how fast we can make the machine go, and now we have to collect our data more intelligently." The team at Cedars-Sinai is focused on collecting a broader range of measurements that MRI can do simultaneously, Christodoulou says. "It's really about doing multiple things at once. What in the past would have been multiple scans all in a row are now done in the space of one scan. There are no pauses," he says. "It's really trying to find new ways to collect and to code the data to maximize efficiency as much as possible." The researchers published a study in Nature Biomedical Engineering in April that shows how their method can reduce MR scan time while increasing diagnostic accuracy and reliability in cardiac imaging, which is often difficult because it would otherwise require that patients hold their breath. The researchers chose to create a data file that is more like a video image than a still image that can be blurred due to patients' motion. "We collect data in six dimensions and separate it out during processing," Christodoulou says. "If a still image is 2D, then a 3D image adds the passage of time. Our 6D images are videos that can be played back four different ways: cardiac motion, respiratory motion, and two different tissue processes that reveal cardiac health." Does it appear that with all these different approaches researchers are getting to the end? Have they reached the limit on minimum scan times? They don't think so. Buonincontri has no doubt that "we are witnessing a huge paradigm shift in the focus and design requirements for new MRI acquisitions, leading to the fast-paced development of new, fast MRI methods." "The field is still wide open. There is still a lot of potential for new algorithms and exploiting other characteristics of MR," Vasanawala says. "There is a fundamental limit of signal-to-noise ratio. At some point, you have to sample long enough to get it. But every time we think we've had a lot of innovation in MRI and it is maturing, something new comes along. So I wouldn't be the one to say we are there." Arjen Radder, PhD, global business leader of MRI at Philips, believes although developments to date have been impressive, "there's still opportunity to go even faster." What's even more exciting, he says, is, if MR scan times can be reduced to no more than a few minutes, MR has the potential to play an even bigger role in diagnosing and treating more conditions and diseases. "MR, which does not require ionizing radiation, could be a very interesting alternative for CT, especially when you combine it with artificial intelligence and adaptive algorithms," Radder says.